This article is about the musician. For other people named Alan Jackson, see Alan Jackson (disambiguation). Alan Eugene Jackson (born October 17, 1958) is an American country singer and songwriter. He is known for honoring a “traditional country” musical style, and for penning many of his own songs. Jackson has recorded 16 studio albums, three greatest hits albums, two Christmas albums, and two gospel albums. Jackson was born to Joseph Eugene "Daddy Gene" Jackson (1927–2000) and Ruth Musick "Mama Ruth" Jackson (1930–2017) in Newnan, Georgia, and has four older siblings. He, his father, mother, and sisters lived in a small home built around his grandfather's old toolshed. The family is primarily of English descent. At one point, his bed was in the hallway for lack of room. His mother lived in the home until she died on January 7, 2017. Jackson sang in church as a child. His first job, at 12, was in a shoe store. He wrote his first song in 1983. As a youth, Jackson listened primarily to gospel music, but otherwise he was not a major music fan until a friend introduced him to the music of Gene Watson, John Anderson, and Hank Williams Jr. Jackson attended the local Elm Street Elementary and Newnan High School, and started a band after graduation. When he was 27, Jackson and his wife of six years, Denise, moved from Newnan to Nashville, where he hoped to pursue music full-time. In Tennessee, Jackson got his first job in The Nashville Network's mailroom. Denise Jackson connected him with Glen Campbell, who helped jumpstart his career. Jackson eventually signed with Arista, and in 1989, he became the first artist signed to the newly formed Arista Nashville branch of Arista Records. Arista released Jackson's debut single, "Blue Blooded Woman", in late 1989. Although the song failed to reach top 40 on Hot Country Songs, he reached number three by early 1990 with "Here in the Real World". This song served as the title track to his debut album, Here in the Real World, which also included two more top five hits ("Wanted" and "Chasin' That Neon Rainbow") and his first number one, "I'd Love You All Over Again". Don't Rock the Jukebox was the title of Jackson's second album. Released in 1991, it included four number-one singles: the title track, "Someday", "Dallas" and "Love's Got a Hold on You", and the number three "Midnight in Montgomery". Jackson also co-wrote several songs on Randy Travis' 1991 album High Lonesome. A Lot About Livin' (And a Little 'bout Love), his third album, accounted for the number one hits "She's Got the Rhythm (And I Got the Blues)" (which Travis co-wrote) and "Chattahoochee", plus the top five hits "Tonight I Climbed the Wall", "Mercury Blues" and "(Who Says) You Can't Have It All". "Chattahoochee" also won him the 1994 Country Music Association (CMA) awards for Single and Song of the Year. In 1994 Jackson left his management company, Ten Ten Management, which had overseen his career up to that point, and switched to Gary Overton. His fourth album was titled Who I Am, and it contained four number one hits: a cover of the Eddie Cochran standard "Summertime Blues", followed by "Livin' on Love", "Gone Country" and "I Don't Even Know Your Name". An additional track from the album, a cover of Rodney Crowell's "Song for the Life", made number six. In late 1994, Clay Walker reached number one with "If I Could Make a Living", which Jackson co-wrote. Jackson also appeared in the 1996 "When Harry Kept Delores" episode of Home Improvement, performing "Mercury Blues". The Greatest Hits Collection was released on October 24, 1995. The disc contained 17 hits, two newly recorded songs ("I'll Try" and "Tall, Tall Trees"), and the song "Home" from Here in the Real World that had never been released as a single. These first two songs both made number one. Everything I Love followed in 1996. Its first single was a cover of Tom T. Hall's "Little Bitty", which Jackson took to the top of the charts in late 1996. The album also included the number one hit "There Goes" and a number two cover of Charly McClain's 1980 single "Who's Cheatin' Who". The album's fifth single was "A House with No Curtains", which became his first release since 1989 to miss the top 10. High Mileage was led off by the number four "I'll Go On Loving You". After it came the album's only number one hit, "Right on the Money", co-written by Phil Vassar. With Jackson's release of Under the Influence in 1999, he took the double risk on an album of covers of country classics while retaining a traditional sound when a rock- and pop-tinged sound dominated country radio. When the Country Music Association (CMA) asked George Jones to trim his act to 90 seconds for the 1999 CMA awards, Jones decided to boycott the event. In solidarity, Jackson interrupted his own song and launched into Jones's song "Choices" and then walked offstage. Alan was also known for wearing a mullet since 1989. Before then, he had short hair. After country music changed toward pop music in the 2000s, he and George Strait criticized the state of country music in the song "Murder on Music Row". The song sparked debate in the country music community about whether "traditional" country music was actually dead or not. Despite the fact that the song was not officially released as a single, it became the highest-charting nonseasonal album cut (not available in any retail single configuration or released as a promotional single to radio during a chart run) to appear on Hot Country Singles & Tracks in the Broadcast Data Systems era, beating the record previously held by Garth Brooks' "Belleau Wood." The duo were invited to open the 2000 Academy of Country Music Awards (ACMAs) with a performance of the tune. Rolling Stone commented on Jackson's style remarking, "If Garth and Shania have raised the bar for country concerts with Kiss-style production and endless costume changes, then Alan Jackson is doing his best to return the bar to a more human level." After the September 11, 2001 attacks, Jackson released "Where Were You (When the World Stopped Turning)" as a tribute to those killed in the 9/11 terrorist attacks. The song became a hit single and briefly propelled him into the mainstream spotlight. At the 2001 CMA Awards, Jackson debuted the song "Where Were You When the World Stopped Turning". The performance was generally considered the highlight of the show, and Jackson's site crashed the next day from server requests. The song came to Jackson suddenly, and had not been scheduled for any official release, but the live performance began receiving radio airplay and was soon released as a single. Jackson released a Christmas album, titled Let It Be Christmas, October 22, 2002. Jeannie Kendall contacted Jackson to do a duet, and he suggested the song "Timeless and True Love". It appeared on her first solo album, released in 2003. In early 2006, Jackson released his first gospel music album entitled Precious Memories. He put together the album by the request of his mother, who enjoyed religious music. Jackson considered this album a "side project" and nothing too official, but it was treated as such. More than 1.8 million albums were sold. Only mere months after the release of Precious Memories in 2006, Jackson released his next album Like Red on a Rose, which featured a more adult contemporary/folk sound. Unlike most of Jackson's albums, this one earned only a Gold Record, and was criticized as out of character by some fans. Unlike his previous albums, Like Red on a Rose had a different producer and sound. Alan's main producer for his music, Keith Stegall, was notably absent from this album. Instead, Alison Krauss was hired to produce the album. She also chose the songs. Despite being labeled as "country music" or "bluegrass", Like Red on a Rose had a mainstream sound to it, upsetting some fans, even making some of them believe that Jackson was abandoning his traditional past and aiming toward a more mainstream jazz/blues sound. However, for his next album, he went back to his country roots. Good Time was released on March 4, 2008. The album's first single, "Small Town Southern Man", was released to radio on November 19. "Country Boy", "Good Time", "Sissy's Song" and the final single from the album, "I Still Like Bologna", were also released as singles. "Sissy's Song" is dedicated to a longtime friend of the Jackson family (Leslie "Sissy" Fitzgerald) who worked in their house every day. Fitzgerald was killed in a motorcycle accident in mid-2007. His sixteenth studio album, Freight Train, was released on March 30, 2010. The first single was "It's Just That Way", which debuted at No. 50 in January 2010. "Hard Hat and a Hammer" is the album's second single, released in May 2010. On January 20, 2011, it was announced that Jackson and his record label, Sony, parted ways. On March 23, 2011, Jackson announced his new deal with Capitol's EMI Records Nashville. It is a joint venture between ACR (Alan's Country Records) and Capitol. All records will be released and marketed through Capitol's EMI Records Nashville label. In 2012, Jackson released the album Thirty Miles West. Three singles have been released from the album, "Long Way to Go", "So You Don't Have to Love Me Anymore" and "You Go Your Way". None of the singles reached the top 20. A tour in 2013 supported the album. Jackson released his second gospel album, Precious Memories Volume II, on March 26, 2013. In 2014, Jackson recorded the opening credits song, "A Million Ways to Die", for the film A Million Ways to Die in the West, co-writing the song with the film's star/writer/director Seth MacFarlane. In August 2014, the Country Music Hall of Fame opened an exhibit celebrating Jackson's 25 years in the music industry. It was also announced that he was an artist in residency as well, performing shows on October 8 and 22. The exhibit highlights the different milestones in his career with memorabilia collected over the years. His twenty-fifth anniversary "Keeping It Country" tour, began on January 8, 2015, in Estero, Florida. In January 2015, Jackson began his 25th anniversary "Keepin' It Country" tour, followed in April with the announcement of his twentieth studio album, Angels and Alcohol, which was released on July 17. In 2016, Jackson was selected as one of 30 artists to perform on "Forever Country", a mash-up track of Take Me Home, Country Roads, On the Road Again and I Will Always Love You which celebrates 50 years of the CMA Awards. In 2016 and 2017, Jackson extended his "Keepin' It Country" tour with American Idol alumnus Lauren Alaina. In August 2016, Legacy Recordings released the collection "Genuine: The Alan Jackson Story" digitally and on three CDs with 59 tracks including eight previously unreleased tracks. In October 2017, Alan Jackson released a new song titled "The Older I Get" from an upcoming album that is set for release in 2018. He was nominated for four 1994 CMAs, including Entertainer of the Year. Jackson became a member of the Grand Ole Opry in 1991; he was inducted by Roy Acuff and Randy Travis. Jackson was the most nominated artist at the 29th annual TNN/Music City News Country Awards that was broadcast June 5 from the Grand Ole Opry House. His six nominations included best entertainer, male artist, vocal collaboration, album, single, and video (two nominations in this category). At the 2002 CMAs, Jackson set a record for having the most nominations in a single year – ten – many rising from the song "Where Were You". It also brought his career total up to the second number of most nominations ever, after George Strait. "Where Were You" also was nominated for a Grammy for Song of the Year. The song was also subsequently parodied in the South Park episode "A Ladder To Heaven". 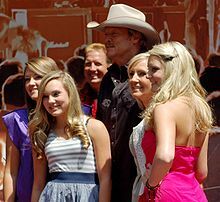 At the 2003 Academy of Country Music Awards, Jackson won Album of the Year for Drive and Video of the Year for the video to "Drive (For Daddy Gene)." In 2004, a five-mile (8 km) stretch of Interstate 85 through Jackson's hometown of Newnan was renamed the "Alan Jackson Highway" in the singer's honor. After learning of the honor, he stated "[Newnan] was a great place to grow up. I'm not sure I'm quite qualified for the main highway. Maybe they should've picked a dirt road or something." Jackson was inducted into the Georgia Music Hall of Fame on October 22, 2001 in Atlanta. 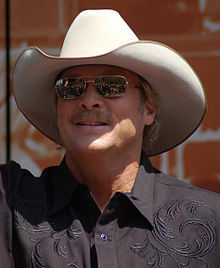 Alan Jackson was selected to receive a star on the Hollywood Walk of Fame in 2010. In 2017, Alan Jackson was inducted into the Country Music Hall of Fame. In 2009, Cracker Barrel Old Country Store, Inc. started to carry the "Alan Jackson Collection" which included a special release CD available exclusively at Cracker Barrel, cowboy style shirts and T-shirts, baseball caps, home goods (candles, kitchen goods) including an old-fashion wooden rocking chair that has a metal plate of Alan's autograph on the headrest; toys, spices and BBQ sauces/rubs and a replica of his own personal cowboy hat. Ford's agency J. Walter Thompson USA in Detroit, in 1992, worked out with Jackson a multimillion-dollar, multi-year contract for his sole endorsement of Ford Trucks. In his video for "Who's Cheatin' Who" he was behind the wheel of a "Big Foot" Ford F-150 pickup truck, and Ford's five NASCAR vehicles (at the time) were prominently featured. Additionally, he changed the lyrics "Crazy 'bout a Mercury" of the song "Mercury Blues" to "Crazy 'bout a Ford truck" in a TV ad for the Ford F-series. Jackson headlined the 1995 Fruit Of The Loom Comfort Tour, a deal worth $40 million. It began January 20 in New Orleans and ran for a hundred dates. Alan Jackson's 2004 concert tour launched January 23 in Fort Myers, Florida and was sponsored by NAPA Auto Parts in a deal that included Jackson's endorsement in TV spots. The tour included more than 50 U.S. dates. Martina McBride was the opening for some of the shows. In March 2011 he visited Australia to perform for the CMC Rocks The Hunter music festival where he was the headline act for Saturday night. In 2015, Jackson kicked off his 25th Anniversary Keepin' It Country tour. The tour began with a concert in Estero, FL on January 8 at the Germane Arena. Jon Pardi & Brandy Clark are special guests for most concerts of the tour. The tour is currently set to wrap with a solo concert in Highland Park, IL at the Ravinia Pavilion on August 31. Jackson married his high school sweetheart, Denise Jackson, on December 15, 1979. They have three daughters: Mattie Denise (born June 19, 1990), Alexandra Jane "Ali" (born August 23, 1993), and Dani Grace (born August 28, 1997). Although the couple separated for several months in 1998 due to the strains of Jackson's career as well as his infidelity, they have since reconciled. Their story is referenced in several of Jackson's songs, including "She Likes It Too" and "Remember When," based on his memories, and the fond views of an everlasting love between his wife and him. Denise and their daughters appear in the latter song's video. Denise Jackson wrote a book that topped The New York Times Best Seller list about her life with Jackson, their relationship, their separation over his infidelity and recommitment to each other, and her commitment to Christianity. The book, It's All About Him: Finding the Love of My Life, was published in 2007. In May 2008 she released a Gift Book titled "The Road Home." In June 2009 Jackson listed his 135-acre (0.55 km2) estate just outside Franklin, Tennessee for sale, asking $38 million. The property sold in late May 2010 for $28 million, one of the highest prices ever for a home sale in the Nashville area. In 2010, after Alan Jackson moved his estate just outside Franklin, the singer then moved into a home in the same Nashville suburb. The singer and his wife paid $3.675 million for the estate in June 2010, but less than a year later they listed the home for $3.995 million. Jackson maintained a close friendship with fellow country singer, George Jones. Jones has been mentioned in songs such as "Don't Rock the Jukebox" (Jones also appeared in the video which accompanied it) and "Murder on Music Row." The song "Just Playin' Possum" is dedicated to Jones and talks of how Alan only wants to lie low and play possum, possum referring to George Jones. Jones can also be seen in the video for "Good Time." In 2008 Jones was a surprise guest at Jackson's "CMT Giants" ceremony, where he thanked Jackson for his friendship. He's also close friends with George Strait, who sang "Murder On Music Row" with him. Besides his associations with big stars, Alan also maintains his connections to his roots and old friends. From his early days of playing the guitar with his old high school friend and fellow musician David "Bird" Burgess on the Burgess' family front porch, it was evident Alan was going to be Newnan's rising star. While "Bird" Burgess has left the country music scene to pursue other avenues, the two have remained friends. At George Jones' funeral service, on May 2, 2013, Jackson performed one of Jones' classics, "He Stopped Loving Her Today," at the close of the service at the Grand Ole Opry in Nashville, TN. For a complete listing of albums and singles by Alan Jackson, see Alan Jackson albums discography and Alan Jackson singles discography. American Music Award for Favorite Country Single 1993; "Chattahoochee"
1993 Favorite Country Album – "A Lot About Livin' (And a Little 'bout Love)"
1991 Album of the Year – "Don't Rock the Jukebox"
1991 Single of the Year – "Don't Rock the Jukebox"
1993 Album of the Year – "A Lot About Livin' (And a Little 'bout Love)"
1993 Single of the Year – "Chattahoochee"
2001 Single of the Year – "Where Were You (When the World Stopped Turning)"
2001 Song of the Year – "Where Were You (When the World Stopped Turning)"
2002 Album of the Year – "Drive"
2002 Video of the Year – "Drive (For Daddy Gene)"
2003 Single of the Year – "It's Five O'Clock Somewhere"
2003 Vocal Event of the Year with Jimmy Buffett – "It's Five O'Clock Somewhere"
2014 Top Christian Album - "Precious Memories Volume II"
1992 Music Video of the Year – "Midnight in Montgomery"
1993 Music Video of the Year – "Chattahoochee"
1993 Vocal Event of the Year – "I Don't Need Your Rockin' Chair"
1994 Song of the Year with Jim McBride – "Chattahoochee"
2000 Vocal Event of the Year – "Murder on Music Row"
2002 Single of the Year – "Where Were You (When the World Stopped Turning)"
2002 Song of the Year – "Where Were You (When the World Stopped Turning)"
2002 Best Country Song – "Where Were You (When the World Stopped Turning)"
2014 Album of the Year – "The Bluegrass Album"
^ Watts, Cindy. "Alan Jackson, Jerry Reed, Don Schlitz tapped for Country Music Hall of Fame". ^ "Songwriters Hall Of Fame Announces 2018 Inductees - Songwriters Hall of Fame". www.songhall.org. ^ Alan Jackson (2014). Biography.com website. Retrieved 03:11, June 6, 2014. ^ "Alan Jackson Biography". Biografiadvd.blogspot.jp. Retrieved April 5, 2016. ^ "Alan Jackson Income – Alan Jackson Net Worth". Getnetworth.com. October 17, 1958. Retrieved April 5, 2016. ^ "Alan Jackson Tickets : Otherwise He Was Not A Major Music Fan". Articlesnatch.com. Archived from the original on March 1, 2016. Retrieved April 5, 2016. ^ "Alan Jackson New Song | Search Net Worth of Celebrities". Searchnetworth.com. October 17, 1958. Retrieved April 5, 2016. ^ "Alan Jackson News | Photos | Quotes | Wiki". UPI. Retrieved April 5, 2016. ^ a b c Ali, Lorraine (February 17, 2002). "Jackson In The Driver's Seat". Newsweek. 139 (7). p. 68. Retrieved August 19, 2018. ^ a b Sanz, C.; J. Sanderson (September 2, 1991), "Honky-tonk hero". People. 36 (8):76. ^ a b Huey, Steve. "Alan Jackson biography". AllMusic. Retrieved March 23, 2011. ^ a b c d Whitburn, Joel (2008). Hot Country Songs 1944 to 2008. Record Research, Inc. pp. 201–202. ISBN 978-0-89820-177-2. ^ Cronin, Peter (November 19, 1994), "Spotlight shines on Jackson's songwriting". Billboard. 106 (47):37. ^ "Home Improvement". Lakeland Ledger. February 20, 1996. Retrieved April 25, 2015. ^ Capozzoli Jr., Michael A. (December 19, 1995). "Homebody: Country star Alan Jackson works hard to fit in as much family time as possible". The Spokesman-Review. Retrieved April 25, 2015. ^ Price, Deborah Evans (September 16, 1995), "20, count `em, 20 Jackson hits". Billboard. 107 (37):32. ^ Peyser, Mark; Alisha Davis; William Underhill (October 4, 1999), "Newsmakers". Newsweek. 134 (14):78. ^ Price, Deborah Evans (May 6, 2000), "Is There `Murder On Music Row'? Debate Continues". Billboard. 112 (19):36. ^ Bessman, Jim (November 24, 2001), "Words & Music". Billboard. 113 (47):36. ^ Price, Deborah Evans (March 1, 2003), "Jeannie Kendall Makes Her Solo Debut On Rounder". Billboard. 115 (9):33. ^ "News". Alan Jackson. January 20, 2011. Retrieved March 31, 2012. ^ "News". Alan Jackson. March 23, 2011. Retrieved March 31, 2012. ^ "Listen To The Title Track For Seth MacFarlane's A Million Ways To Die In The West". Cinema Blend. April 29, 2014. Retrieved April 30, 2014. ^ Joseph Hudak, "Alan Jackson Honored With Country Music Hall of Fame Exhibit",Rolling Stone, July 23, 2014. Retrieved December 8, 2014. ^ a b Alan Jackson 25th Anniversary Tour. 2014. Retrieved January 2, 2015. ^ "Alan Jackson Turns to 'Angels and Alcohol' for New Album". Rolling Stone. April 9, 2015. Archived from the original on April 23, 2015. Retrieved April 23, 2015. ^ News, A. B. C. (September 22, 2016). "30 Country Music Stars Join Forces for Historic CMA Music Video". ABC News. Retrieved December 2, 2016. ^ "Alan Jackson :: About | Alan Jackson". www.alanjackson.com. Retrieved December 2, 2016. ^ Author unknown (Fall 94 Special Issue), "Livin' in the real world". People. 42 (9):20. ^ "Alan Jackson – Chronology". Official Alan Jackson Website. Retrieved April 22, 2015. ^ "Alan Jackson". Grand Ole Opry. Retrieved July 2, 2012. ^ "Opry Member List PDF" (PDF). April 23, 2012. Archived from the original (PDF) on June 7, 2012. Retrieved July 2, 2012. ^ Stark, Phyllis (September 7, 2002), "Jackson Nominated For 10 CMAs". Billboard. 114 (36):6. ^ "Jackson Honoured With Highway Stretch". Contact Music. July 13, 2004. Retrieved November 11, 2015. ^ No byline (November 10, 2001), "In The News". Billboard. 113 (45):36. ^ "Cracker Barrel". Archived from the original on June 10, 2012. Retrieved July 2, 2012. ^ Halliday, Jean (May 19, 1997), "Jackson lets Ford star in his latest music video". Advertising Age. 68 (20):10. ^ Lichtman, Irv (January 21, 1995), "Jackson Fruit of Loom tour". Billboard. 107 (3):86. ^ "CMC Rocks the Hunter". Archived from the original on February 22, 2011. Retrieved March 22, 2011. ^ "Alan Jackson 2015 25th Anniversary Keepin' It Country Tour Schedule". ConcertTourNewsHub.com. March 5, 2015. Archived from the original on April 2, 2015. Retrieved March 26, 2015. ^ Schindehette, Susan; Keel, Beverly; Sanderson, Jane; Stewart, Bob; Calkins, Laurel (March 9, 1998), "Achy-breaky hearts". People. 49 (9):48. ^ Tom Kielty (July 16, 2008). "Rocking with the Sox: Brandon Moss". BostonHerald.com. Retrieved October 29, 2008. ^ Wood, E. Thomas (June 1, 2010). "Country star's palace sells for $28M". NashvillePost.com Retrieved on June 1, 2010. ^ "Celebrity Homes | Nashville Real Estate". Nashville on the Move. Nashvilleonthemove.com. Retrieved January 25, 2012. ^ a b c Tyler Moreland, March 8, 2008, Times-Herald," Community Edition, "Highway Renamed"